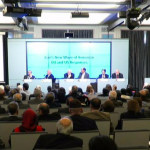 On Thursday, October 4th, The International Committee in Search of Justice (ISJ), held a conference entitled the New Wave of Iranian Terrorism. The conference came after the Iranian regime increased its international terror activities. In late June, an Iranian diplomat working at the Iranian embassy in Vienna provided a Belgian-Iranian couple with explosives to be used in an attack against the annual gathering of the People’s Mujahedin Organisation of Iran (MEK). The foiled attack came just weeks after another failed bombing against the MEK in Albania. Shortly afterward, two Iranians were arrested in the US on espionage charges. The arrests and foiled terror attacks mark an uptick in dangerous and nefarious activity from the Iranian regime. Finally, Alejo Vidal-Quadras, the former Vice-president of the European Parliament offered some of the most inciteful comments of the day. He said, “we must learn the lessons of history. There are enemies who can be turned into friends and those who must be defeated”, adding, “it is time to change our approach and promote regime change in Iran”. The conference dealt with how European nations should respond to this show of aggression. Giulio Terzi, the former Italian Foreign Minister, who was at the MEK’s Grand Gathering in June, was unequivocal in his response. He condemned state-sponsored terrorism as “something completely against the unity that exists in the European institution”. He was also concerned about how Europe should respond to this threat. He was concerned by European leaders “selling a wrong narrative to the public” regarding the Iranian regime. Despite what European leaders believe, Iran’s leadership cannot be reasoned with. Terzi welcomed the news that Iranian diplomat, Assadollah Assadi, had been extradited to Belgium to face charges for his involvement in the Grand Gathering attack, but wished more had been done. “I don’t recall any other threat being… as it was with Villepinte”, he said, lamenting the lack outpouring from the European community. He suggested that recent events in Europe were just the beginning of exposing the Iranian leadership’s behaviour. He pointed to other dangerous activities undertaken by the Iranian regime both in the Middle East and beyond. Terzi mentioned Iranian-backed organisations in Germany and Italy that are heavily involved in radicalizing young Shia Muslims. “There is a conflict of interest between the necessity of fight[ing]… terrorism and the policy on Iran”, Terzi asserted, “in Europe [the] highest places are just looking away”. Terzi called for a more decisive position from the European heads of state regarding Iran, echoing the comments of President-elect and leader of the MEK, Maryam Rajavi. Terzi compared the threat of the Iranian regime to that of the Islamic State (IS), calling Iran a “much bigger threat as a terrorist country”. Bob Torricelli, a former US Senator and member of the House of Representatives, echoed Terzi’s comments. He called the failed terror attack in Paris, “part of a pattern, not an isolated event”. Torricelli suggests that the increase in violence may stem from the regime’s weakening position in power. “It is a pattern well-recognised in history”, he said, “as a despotic regime is under pressure”. Torricelli called it a “defining moment” for Europe. For Torricelli, sanctions are the way forward. His final words urged the European community to “forego some contracts” and apply economic pressure to the Iranian regime.